Evening Meetings are Craig Chambers, Matthew Ford, Erin Sullivan, and Min Yee. Together they have been part of the great stream of underground bands coming from Seattle over the past decade – A Frames, Love Tan, Factums, Intelligence, The Lights, Le Sang Song, The Dipers, Yves/Son/Ace, AFCGT, etc. Sweet Rot has been a huge follower of these bands over the years (releasing a Love Tan 7″ in the process) and we couldn’t be happier to release the band’s debut s/t LP. Each of the ten songs featured here is grounded upon a solid foundation of rhythm while the two guitars are free to poke and lurch wherever they please, sometimes off-kilter and noisy, sometimes fuzzed out, and sometimes twangy and sliding bringing to mind acts such as Gun Club or Scientists. While most songs aim directly for the jugular a few are a bit more loose and wandering, similar to the band’s excellent 7″ on Dirty Knobby. The end result is a mature, focused, confident record that we think will stand the test of time. Expertly recorded by Alex Yusimov at The Pool on all analog gear and mastered by Timothy Stollenwerk. I loved the debut Evening Meetings single, so I was delighted to learn of this full-length – these guys don’t waste time! I think whenever these Pacific Northwest punk groups get together, they don’t just think about doing a demo, they plot out their first five singles and two LPs within the first week of practice. 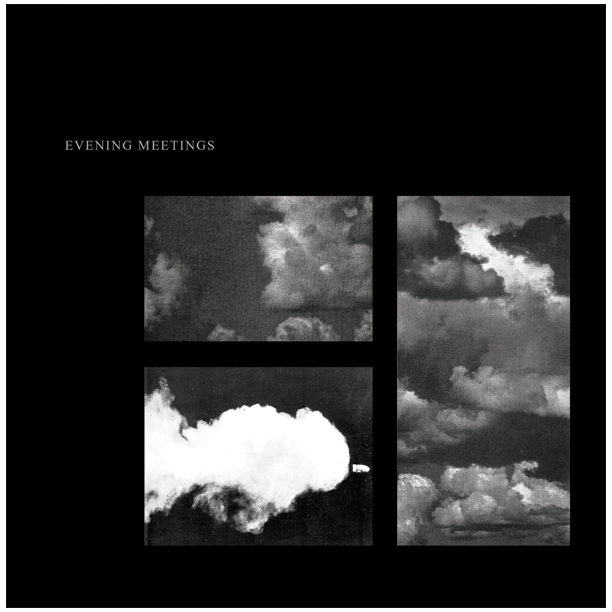 When it comes to Evening Meetings, I’m alright with that, as Defended By Clouds is a very cool rock record. The single was a DIY riddler, so I was surprised to hear that Evening Meetings kinda just turned into a real band, complete with bass, guitar, drums, vocals and a proper studio recording. The riffs are cool, swinging somewhere between The Intelligence and Guinea Worms, but it’s the vocalist that makes it for me. There’s no lyric sheet, but he cracks me up repeatedly, and not through garage-rock drunken idiocy, but actual wit – it’s like he sits in his cubicle all day coming up with sharp one-liners and funny wordplay, and Evening Meetings is his way of letting them loose. The songs are actually quite tuneful too, in a way that I could see Rough Trade in 1982 or Goner in 2012 taking equal interest. The more I listen, the more I dig it, but please Evening Meetings, give me at least six months before the next album – I know how you guys like to operate, and I want to spend some time enjoying this one. Chances are if a band has a connection to A Frames, its a good bet they’re worth checking out. Holds true for The Intelligence, Factums, AFCGT and it definitely rings true for Evening Meetings’ full length on Sweet Rot. The LP pulls from the same gritty post punk bowels that A Frames and much of the rest of that lot wade in but ends up aligning itself nicely with some of the more caustic Aussie fare, a la Slug Guts and Kitchen’s Floor. The vibe is rust plated and ready to grind down the dust and on repeated listens there are more than a few gems lurking in the murk on this one. Slung low guitar jams a plenty and mind you Sweet Rot doesn’t just go putting out long players everyday so when they commit to the full twelve inches you better sit up and take notice. Guaranteed to make your turntable howl. TOUGH CUSTOMER “Darlene” 7″ – out now! PUSTOSTANY “2012″ LP – out now! MEERCAZ & THE VISIONS “Get Muzzled” LP – out now! DREAMSALON “Soft Stab” LP out now! NERVE CITY “Asleep On The Tracks” LP out now! © Copyright 2012 Sweet Rot Records . Thanks for visiting!